Recent release “Mr. 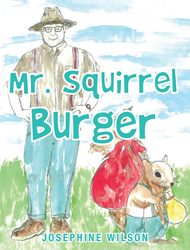 Squirrel Burger” from Page Publishing author Josephine Wilson is an amusing and entertaining children’s work full of animated animal characters. Josephine Wilson, a mother, grandmother, associate minister, devoted writer and author, has completed her new book “Mr. Squirrel Burger”: a passionately crafted work that takes the reader on an adventure with some furry friends. Published by New York City-based Page Publishing, Josephine Wilson’s animated work is the perfect read for children and adults alike! Readers will enjoy this heartwarming and delightful story about a single parent squirrel who goes to great length to provide food for his little triplet squirrels—Squint, Squeal, and Squeaky. This is a must-read book to find out if, after being threatened, the squirrel will become a squirrel burger. Readers who wish to experience this enjoyable work can purchase “Mr. Squirrel Burger” at bookstores everywhere, or online at the Apple iTunes store, Amazon, Google Play or Barnes and Noble.